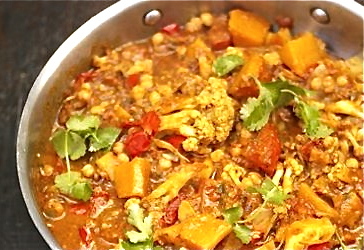 This dish is amazingly flavorful, incredibly healthy and loaded with fantastic aroma and spice. It is very high in fiber, and very low in calories. 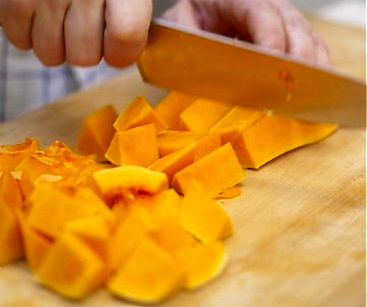 Butternut squash prepared with the skin left on takes on a wonderful nutty flavour. Served over brown rice, it makes a wonderful dinner for those chilly evenings at home. Drizzle olive oil in a large skillet, and set at medium high heat. Add the onion and ginger and cook, stirring frequently, until the onion is softened, 4–5 minutes. Stir in the salt, pepper, curry powder and cumin and continue to cook, stirring constantly, about 1 minute. Stir in the tomato purée, coconut milk and water. Reduce the heat and simmer, covered, stirring occasionally, about 15 minutes. Add the butternut squash, cauliflower, pepper and chickpeas. Cover and simmer for 15 to 20 minutes. Remove from the heat and let cool slightly. Pour over steamed brown rice. Sprinkle with fresh parsley or cilantro. This recipe was adapted from Jamie Oliver’s 30 minute meals. This entry was posted in Uncategorized and tagged cauliflower, curry, Squash. Bookmark the permalink. Wow! I’m excited to try this one! Looks amazing!